I never imagined ten years ago when I first met the gorgeous Sandra Howard during my role as the Conservative Party’s Eastern Region Press Officer during the 2005 general election when her husband Micheal was the Tory party leader that I would one day be sharing a literary lunch platform with her. Sandra has a beauty and aura that attracts many admirers and has achieved recognition not only for her charm, but for her writing skills too. 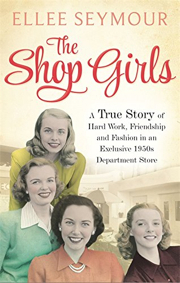 It is a great honour to join her and speak about The Shop Girls at The Sick Children’s Trust Cambridge Fundraising Committee literary lunch in the fabulous setting of Madingley Hall on Monday, 9 February. The Trust has financed two new homes for families of seriously ill children at Addenbrooke’s Hosptial, Acorn House, which opened in 2000, and Chestnut House, which opened in 2013, to keep families together and continues to fund their costs. I myself have used a similar facility in London when my son was treated at Great Ormond Street Hospital, and know only too well how much it is appreciated by anxious parents. I can’t wait to hear Sandra speak. She is a former fashion model and will talk about her varied life as wife of the former Conservative Party leader, as well as her latest novel, Tell The Girl, in which she draws on her modelling career. Tickets cost £30 for a two-course lunch, including wine, and are available by ringing 01223 311877.